We know a lot about how genes get passed from parent to child, but scientists are still unraveling how so-called epigenetic information—instructions about which genes to turn on and off—is conveyed from generation to generation. Using the tiny worm Caenorhabditis elegans, a simple and powerful model for uncovering the fundamental workings of epigenetic inheritance, Harvard Medical School geneticists and colleagues have just discovered two new proteins contributing to this process. "We have a fantastic example here of epigenetic inheritance that we think will make important contributions to the field," said Scott Kennedy, the Philip and Aya Leder Professor of Genetics at HMS and senior author of the study, published online May 16 in Nature. 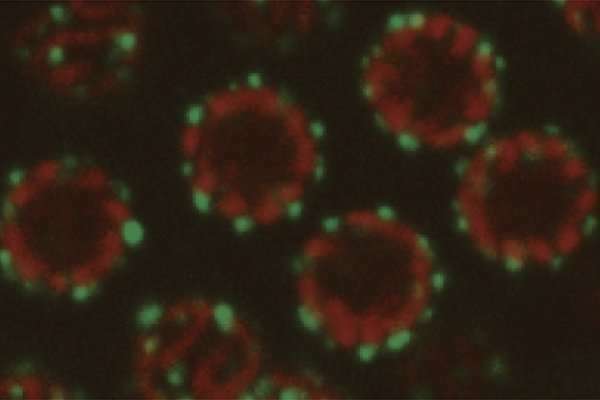 Probing further, the researchers found that the proteins form a never-before-seen membrane-less liquid droplet in the cell cytoplasm, which the team dubbed the Z granule. The Z granule interacts with two previously identified droplets in an unexpected way that not only illuminates some of the steps leading to epigenetic inheritancebut also provides new insights intohow liquids can behave within other liquids. "It's exciting to see three liquid droplets take shape within a fourth liquid, forming ordered configurations and not mixing with one another—that's pretty wild for a number of reasons," Kennedy said. Kennedy and colleagues suspect that the droplets help organize the process of deciding which genes to express by allowing only certain RNAs to be turned into proteins. The researchers began by screening for genes needed to transfer epigenetic information from an adult C. elegans to its progeny. They spotted two that hadn't been implicated before. The genes make the proteins ZNFX-1, short for "zinc finger NFX1-type containing 1," and WAGO-4, short for "worm-specific argonaute protein 4." Both proteins bind to RNAs, the strings of genetic information that drive many of the phenomena associated with epigenetic inheritance. Tagging ZNFX-1 and WAGO-4 with fluorescent molecules revealed that they are located almost entirely in germline cells, which lead to sperm and eggs. That further raised the scientists' confidence that the proteins are involved in inheritance. The researchers watched C. elegans develop from a fertilized egg into an adult and discovered that ZNFX-1 and WAGO-4 begin life as part of a droplet called the P granule. That made sense to the team; P granules are known to be the worm version of droplets found in germ cells across animal species, including humans. P granules and other liquid droplet organelles, also called liquid-like condensates, intrigue scientists because their purpose is mysterious and because they remain distinct from the cytoplasm even though they lack a membrane. "There's no bag holding them together," said Kennedy. "It's like a drop of oil in water, except they're not made of oil." What surprised Kennedy and colleagues was that as the worms matured, ZNFX-1 and WAGO-4 bubbled out of the P granule and formed their own droplet, the Z granule. The P and Z granules somehow stuck close together without merging. "They sit right next to each other and don't float off," said Kennedy. "How do they do it? And why?" As the team continued to watch, a third droplet, previously discovered by HMS scientists at Massachusetts General Hospital and called the Mutator foci, took shape and joined the cluster in the same perplexing way. 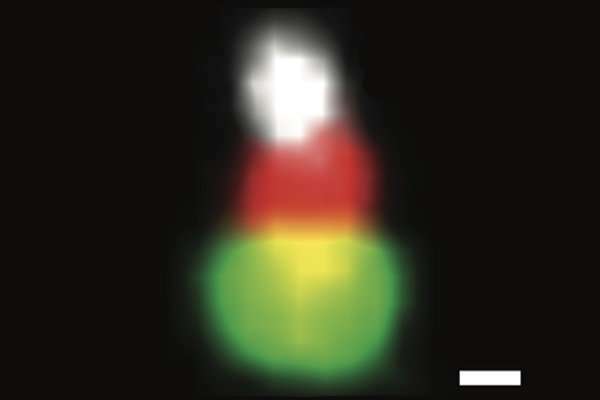 With each granule fluorescently labeled, the tripartite structure reminded Kennedy of a snowman or Dr. Seuss' Grinch at Christmastime: a green P-granule head wearing a red Z-granule hat with a white M-granule pom-pom. The fact that the granules form in a particular place within C. elegans and in a specific order with respect to one another during embryonic development suggested to Kennedy that the whole assembly is genetically programmedand not incidental. Additional clues about the purpose of the granules lay in their location in the cell: They perch on the nuclear membrane next to pores where RNAs emerge. Before those RNAs fully enter the cytoplasm to be translated into proteins, "they have to go through this phalanx of granules, probably in a particular order," said Kennedy. The arrangement led the researchers to suspect that the Z granule makes decisions about RNA processing and then records those decisions for future generations. "The granules act like sieves or gatekeepers, asking, 'Should I express you? Do I want you to become a protein?' and 'Do I want my children to remember that you should or shouldn't become a protein?'" said Kennedy. Overall, the three-droplet structure may help organize the flow of protein-making instructions from the nucleus to the cytoplasm, the authors said. "Gene expression is incredibly complicated. This could be a system by which you order it, so A happens before B happens before C," said Kennedy. The researchers suspect there are at least two more droplets involved that haven't been definitively identified yet, which would make the structure even more complex. "This C. elegans system is powerful because we're poised to figure out the precise role of these droplets and to test whether they're necessary for epigenetic inheritance," said Kennedy.